At Clinique Dentaire du Boulevard, we use the Iveri whitening system to give our patients a whitening treatment tailored to their needs. We believe Iveri offers an excellent, flexible treatment to give you a great white smile that lasts. So why do we use Iveri Whitening? 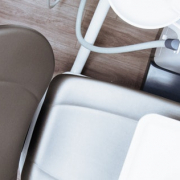 First of all, Iveri is a chair-side procedure, which means there is no need for trays and strips once you leave the Clinic. This means more immediate results and less fussing with products and gels at home. The procedure takes about an hour and gives you results after only one visit. The technique uses a whitening gel, with the main active ingredient being hydrogen peroxide, which is light-activated using a special lamp. The light helps the gel penetrate the surface of your teeth for longer-lasting whitening. The procedure is very safe, under the supervision of a dentist, and is different from other over-the-counter solutions, as the treatment is tailored to your needs and dental health. The treatment is, however, not recommended for children under the age of 13 or for pregnant or lactating women. Don’t hesitate to ask us about Iveri next time you visit us.